Man is what he eats, goes a famous German saying, and yes, he is in the material sense because all that he is, his flesh and bones down to his veneer of skin and chinny chinny chin, he gets from the food he eats. And so let us begin our gastronomic journey from the earliest of men who dwelled in our island several thousand years ago. By this I mean our Stone Age Men, of course! These men of old who dwelt in caves and hunted in droves had it good. They were tall and robust and well-fed as may be inferred from their skeletal remains strewn all over the country and especially in the fertile Low Wet Zone of the Island such as the Ratnapura District. They had plenty to choose from a rich environment and made the most of it. They were lucky men, but at times they fed on their own, not due to want of good meals, but for the kick of it or perhaps some arcane ritual lost in the mists of time. Stone Age man in Sri Lanka is popularly known as Balangoda Man (Homo sapiens balangodensis) on account of his role in the Mesolithic Balangoda culture which was first defined in sites near Balangoda in the Ratnapura District of the Sabaragamuwa Province. However, some of this folk ventured closer to the coast, to places like Pallemalala in the Hambantota District of the Southern Province. They flourished in the island thousands of years ago before their descendants dwindled in the face of Aryan and Dravidian incursions from India and eventually became today’s Veddas. So let’s try to digest what these men of old dined on. It’s not that hard really. If you think our prehistoric friends ate their meat raw, you’re sadly mistaken. Lightly burnt animal bones and many a hearth excavated by archaeologists testify to a rudimentary knowledge of fire-making and roasting meats. (I told you our ancient friends had it good!) Who knows, they may have enjoyed great barbeques in those days of plenty. They were wise men too. so wise to the ways of the world that they even had well developed wisdom teeth unlike today’s men who strut the earth in vain. Yes, what remains of their skulls have revealed well-developed wisdom teeth, indicating that they made good use of their jaws and teeth to tear apart and chew their meat-rich diet. In modern man, the wisdom teeth tend to recede into the gums as a result of limited jaw movements while eating their more refined meals that obviously do not require much tearing and chewing. So your typical prehistoric pal would have done a lot of munching and must have sounded terrible when he gnawed on his meat ‒ not a very pleasant dining partner. From what we can gather from the faunal remains left over from his hearty meals, Balangoda man was a carnivore to the core. 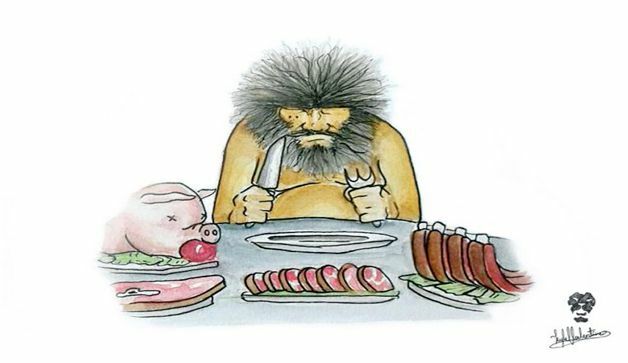 He loved to gorge on meats of all kinds and was sure a very meaty fellow as a result. Meats gave him the protein he needed to make his day. It was of course easier to procure smaller game than larger ones, and this is borne out by the numerous animal remains of small game. If he hunted larger animals such as elephants, he showed a preference for the younger ones. The teeth of juvenile elephants found among these food remains bear this out. Obviously he was no fool to take on the larger ones. Large bovids, either water buffalo, gaur, or both, were eaten with relish. It is also supposed that a smaller ancestor of Bos Indicus (the local breed of cattle which became extinct in the 1930s) that lived in a wild state in prehistoric times was exploited as well. Other fare included wild boar somewhat like the kind Asterix and company used to devour in their nightly banquets and various types of deer such as Spotted Deer, Hog Deer, Barking Deer and the little Mouse Deer.It was the smaller animals, particularly tree-loving arboreal species such as monkeys and squirrel that were hunted the most due to the ease of bringing them down with an arrow or two. In fact, an analysis of faunal remains gathered from these prehistoric cave sites suggests that the vast majority of the remains ‒ as much as 80 percent ‒ were of smaller animals such as hares, monkeys, porcupines, pangolins, and squirrels. The flesh of wild fowl such as the Sri Lankan spur fowl were consumed with much relish. Since this bird lives mostly on land and seeks the shelter of trees at night to avoid predators, it was easy to hunt or trap. The jungle fowl, Gallus lafayetti, was another favourite. A large number of nests of the swift Callocalia brevirostris unicolor have been found in certain parts of the island such as in Ravanalla cave, and it is quite possible that these were harvested for their eggs and swiftlets. These edible nests made up of the dried agglutinative saliva of the birds themselves do not seem to have been eaten, though had the Chinese ever learned of it they would have probably colonised our country as they so esteem this delicacy. The enmity between man and snake is at least as old as the Bible, which has our first parents being tempted by the snake which may have well been a figurative way of describing that arch fiend Satan. That man has some primordial fear of the snake seems very obvious. Balangoda Man overcame his fear of the critter by making a meal of it. Numerous snake vertebrae discovered by archaeologists indicate that several varieties of snake were consumed by him. This included the python, one of which could have fed a group of men for several days. Many seem to think it’s only the Chinese and French who love snails. Not so; Balangoda Men loved snails too. These were not the land snails saddled with brownish purple conical shells we are so familiar with today. These fast breeders of African origin were introduced to the country only around 1900 before proliferating at the expense of native species like the tree snails. Although people shun them, they are said to be a particularly nutritious source of meat, containing, it is said, as much protein as beef. However it were the tree snails of the Acavus species that seem to have been consumed most by our Balangodans. Snails breed profusely and are common in the wet rainforests. Easy to gather as mushrooms, they also provide a relatively high amount of animal protein. No wonder they were a favourite choice of our prehistoric friends. Their snail diet included Acavus Waltoni, Acavus Roseolabiatus and Acavus Prosperus. Aquatic snails of Paludomus species like P.Solidus, P. Nodulosus and P.Loricatus and a type of swamp snail, Pila Globosa, were also swallowed with relish. 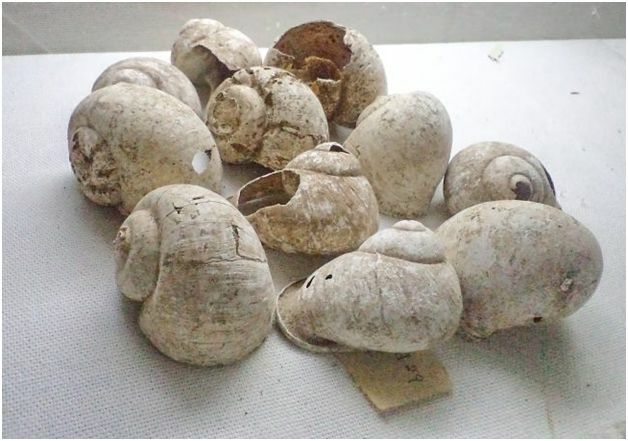 The floor of Batadomba cave, a favourite site of these folk, was found to be strewn with Acavus species to a depth of five feet which shows the large quantity of snails consumed at just this one site. Bellan-bandi Palassa, whose very name means ‘the glade strewn with snails’, has also yielded Acavus remains while Beli-lena, whose name literally means ‘snail-cave’, contains large concentrations of molluscan shells which formed mini-middens. A great many snail shells belonging to the Acavus species show a piercing of man-made origin in the body whorl and it is likely that it was done to string these shells with a piece of vine to facilitate the transportation, storage and cooking of such snails. This overcame the problem of carrying handfuls of live snails back to the occupation site and helped store such snails and render them immobile for a few days. The reason for subjecting them to this forced fasting may have well been to rid them of their gut contents since otherwise it would not have been possible to consume them. What’s more, a string of such snails could easily be barbecued or roasted on a flame or on charcoal. Wonder what they tasted like, these roasted snails? The lazy louts still make easy pickings and you’re free to try them out. Just make sure you aren’t in a wildlife reserve when you pick them up. Was men eating men as weird and outlandish then as it is today? There have, of course, been instances of what is called survival cannibalism until fairly recent times when it was resorted to by shipwrecked sailors who consumed their own shipmates after drawing lots. Nathaniel Philbrick’s In the Heart of the Sea will give you an idea of what it was like. Then there is what is called dietary cannibalism, when the eating of human flesh has been indulged in when one’s survival is not at stake, though perhaps not as part of a regular diet. One cannot also rule out the possibility of ritual cannibalism where the eating of human flesh was indulged as a religious ritual. There have been occasions when even people thought of as rather peaceable have engaged in this practice. For instance a recent study of skeletal remains at an Anasazi Pueblo site in Southwestern Colorado indicates that a cannibal feast had indeed taken place here, with nearly 30 men, women, and children being butchered and cooked there around 1100 AC. Further, as D. Korn, M. Radice, and C. Hawes note in their book Cannibal: A history of the People-Eaters (2001), cut-marks on human bones have been observed on different continents from a range of different time periods. This has led them to conclude that “the fossil record is only a tiny sample of people who lived in the past. If we are picking up butchery in this very sparse sample of humans and human behaviour in the past, then it cannot have been a very rare event”. 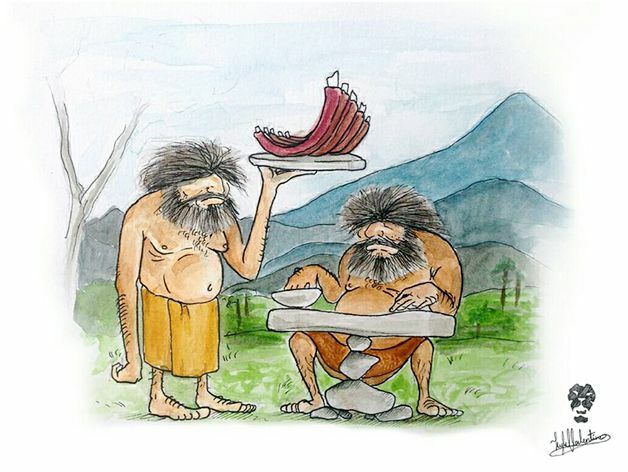 So did our Stone Age Men eat their own kind at any point, perhaps in times of scarcity or perhaps as a ritual? Evidence does suggest it is possible that they did engage in cannibalism on occasion. In the early 1970s well known archaeologist S. Deraniyagala argued that Balangoda Man was a cannibal. The telltale signs amongst the food debris in at least one site, Bellan-bandi Palassa, included longitudinally cracked human bones, fractured mandibles, and calvaria which had been smashed probably for extracting the brain. Further, a human femur was found with an incision thought to have been made during the stripping of flesh. Now, when human bones bear cut and chop marks, it indicates that defleshing had taken place by similar butchering techniques used for animals. Beli-lena Kitulgala and Batadomba lena have also yielded isolated fragments of human bone in ashy deposits with food remains. Would this suggest that human beings were used as a food source by these primitive cave dwellers? Not so fast. To conclusively prove cannibalism, a number of archaeological indicators must be present. This includes, among other things, the presence of human and animal remains in the same context and the absence of mortuary rituals such as placement of the deceased and inclusion of funerary artifacts that respect the body. Thus, osteological evidence must be backed up by the manner of disposal of human remains; cannibalised remains would obviously not be subjected to mortuary rituals or deposited as formal burials, but rather discarded within the faunal remains without deferential treatment of any sort. In other words, they are treated as and discarded as any other food remains. Although Deraniyagala’s contention meets some of these criteria, it does not seem to be rigorous enough to establish it as a certainty. In fact, Kenneth Kennedy in his God-apes and Fossil-men (2000) disputed that Balangoda Man was a cannibal since the telltale marks of trauma are absent in the skeletal remains. Thus there is a need for unearthing more evidence to conclusively establish whether Balangoda Man actually engaged in cannibalism. This could include more detailed osteological studies of the remains. It has been found that human faces have strong muscle attachments that make them more likely to have cut marks and modifications than other faunal remains. Must have been a real face-off with these guys! Furthermore, cannibalism could be conclusively established if myoglobin, a human protein occurring in muscle tissue, is found in cooking vessels or coprolites, ancient human faecal matter, the reasoning here being that the depositor of such faeces containing myoglobin would have had to ingest human flesh. To prove cannibalism, therefore, it is imperative that such coprolites that have survived be detected or retrieved from these sites or in their vicinity. So far we know of none that have turned up, but who knows, perhaps some day. As they say the proof is in the eating! Paleo-ecological records of Sri Lanka at the period in which Balangoda man lived in Bellan-bandi Palassa suggest the island at that particular period did experience some severe arid conditions. Although the onset of the monsoons as indicated by early Holocene pollen records meant a fertile high-humid period that allowed vegetation to thrive, a decline in the monsoons during the middle part of the Holocene, which covers the date of 6500 BP for the Bellan-bandi Palassa site, led to a long spell of arid climatic conditions not conducive to the growth of vegetation. This phenomenon was not confined to Sri Lanka but affected the entire region, as indicated by a decline in vegetation cover and low lake levels in North Africa and the Indian subcontinent. This development has been attributed to monsoon failure during that period. Under such environmental stress, it is possible that food crises due to lack of forest and diminishing flora and fauna could have affected our tropical environment and rainforest. That this led to a scarcity of wildlife at the site cannot be proven since a number of animal remains have been found here including in association with the human remains thought to have been cannibalised. Among the faunal remains found here were wild boar, sambhur, spotted deer, barking deer, mouse deer, toque monkey, grey langur, pangolin, porcupine, giant squirrel, monitor lizard, star tortoise and hard- and soft-shelled terrapin besides a variety of snails showing that a wide range of animals were being exploited for food. This would suggest that Bellan-bandi Palassa Man probably did not suffer from starvation as to warrant resorting to survival cannibalism. However, at the same time, it is possible that there would have been intermittent periods that led to animal death or migration due to drought. This could have caused severe nutritional stress leading to the adoption of cannibalistic practices which even in better times would have been continued. If this be the case we would have to assume that survival cannibalism would have with time degenerated into dietary cannibalism, and dietary cannibalism in turn could have been masked as ritual cannibalism when those who practiced it needed religious justification to do so. That’s food for thought! It is possible that cannibalism was practiced in prehistoric Sri Lanka since this is reflected in ancient legend. For instance, the Valahassa Jataka tells of a race of Yakkhinis (she-demons) who lived in Sirisavatthu in the island of Lanka, who were in the habit of enticing ship-wrecked merchants into their city and then devouring them. The Divyavadana, a Sanskrit work assigned to the 3rd or 4th century AD, also relates a somewhat similar legend. The Mahavaṁsa, a chronicle of Sinhalese royalty compiled in the 5th century AD by the monk Mahanama, alludes to the Yakkhini woman Kuveni herself being a party to such crimes when it alleges that she showed the founder of the Sinhalese nation, the Bengali Prince Vijaya, “many different things such as rice, which were in the ships of merchants who had been devoured”. Such tales would have perhaps been circulated by interested parties engaged in trade with the aboriginal folk so as to deter others who might have been a potential threat to their commercial interests. At the same time, however, we cannot discount the possibility that such tales of cannibalism were circulated by interested parties intent on preserving their interests in the island’s trade which we may suppose was a lucrative one to foreign traders who resorted to these parts and engaged in what is known as silent trading with the aborigines of the island. Herodotus, who supposed that Arabia produced cinnamon, mentions in his Historia (5th century BC) that cinnamon was collected by the Arabs who knew nothing of the country in which it was produced. He says that they can neither tell how, or in what region, this aromatic spice is produced, though he goes on to relate that the best they can say is founded upon conjecture, some holding to the view that it was obtained from birds said to have made their nests of cinnamon stick fastened with mud in mountainous cliffs inaccessible to men. It is likely that such stories were invented by these Pre-Islamic Arab merchants to keep the source of this spice a secret, thus preserving their monopoly of the trade. The best cinnamon as we know comes from Sri Lanka, which at one time was the only source of real cinnamon. It was not only cinnamon, but also other spices and precious stones that attracted ancient traders and mariners to the shores of Lanka. What Can The Veddahs Tell Us? Veddah shooting with bow and arrow. Image courtesy Seligmanns. 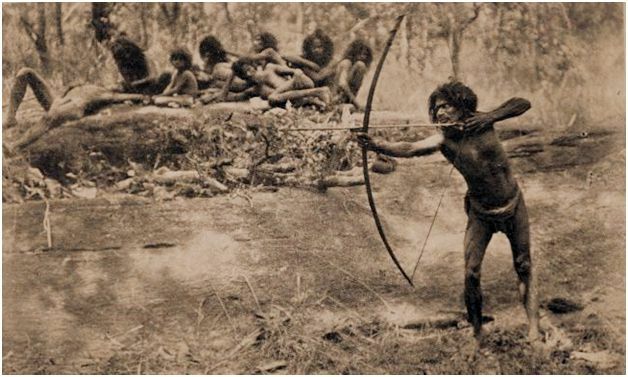 The Veddahs we know are the descendants of Balangoda man, a group of whom had found their way to the Eastern hinterland a long time ago, not the least to preserve their traditional way of life as hunters and gatherers in the face of intrusions into their lands by the Sinhalese of Aryan origin. So could not the Veddahs have preserved vestiges of cannibalism had it been practiced by their stone age forebears? Although we have no direct evidence to show that the Veddahs ever engaged in cannibalism even in the most trying of times, a vestige of it perhaps survived up to the nineteenth century in the form of the now obsolete practice of possessing a piece of human liver which they would bite on occasion. In fact, visitors to Veddah country in the olden days observed a very interesting practice the Veddahs of their time indulged in. They would bite a piece of dried human liver perhaps obtained from victims who had dared transgress Veddah territory when provoked beyond a reasonable limit. C.G and B.Z.Seligmanns in their monumental work on the Veddahs published in 1911 note that in former times, the Veddahs had a custom of carrying about on their persons a piece of dried human liver which was obtained from strangers, including other Veddahs, who had intruded into their hunting grounds. When provoked beyond a reasonable limit, such as in the case of a wife’s infidelity or theft of his arrows, he would bite the piece of liver and work himself into a frenzy. Interestingly this seems to be the origin of the Sinhala expression mama uge kevutta kanava (I’ll eat his liver). The Veddah practice, it is possible, arose from a belief that biting a piece of human liver conferred upon the person who tasted it the power of the original owner of the organ, the liver here being considered the repository of human potency. The underlying reason seems to have been some obscure idea of mana, the extra power immanent in a person’s liver. Belief in the animistic power of what is known as mana which is believed to imbue one with the power of the possessor of the organ is a very primitive and widespread idea, though the belief that it resided in the liver seems to be largely a South Asian idea, found for instance among the aboriginal Munda-speaking tribes of Chota Nagpur in Eastern India who considered the liver as the seat of the vital principle. What is also interesting is that the Sinhala term for liver, akmava, has derived from the Sanskritic agra-mamsa (foremost flesh) which means the ‘heart’. This might suggest that Veddah ideas pertaining to the liver as the seat of human power or the vital principle had influenced the thinking of their Sinhalese neighbours at some remote period. But who knows, it may well be a vestige of an earlier practice of cannibalism indulged in by their Stone age ancestors. 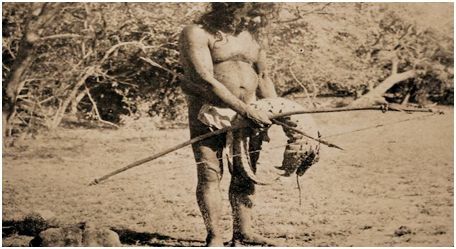 It is also possible that genetic evidence could be used to establish cannibalism of Balangoda man by studying their living descendants, the indigenous Veddah population of the island. Indeed there are those who believe that cannibalism was so widespread and deeply embedded a practice as to leave its mark on the human genome. Researchers working on the British epidemic of mad cow disease wondered why it turned out not to be so deadly in this nation of beef eaters, until it turned out that they were in part protected by their ancient cannibal heritage, a mutation of which conferred protection against brain-eroding pathologies caused by misshapen brain proteins known as prions which, if consumed, could cause brain rot. Subsequent genetic tests on other populations confirmed the existence of this ‘protective signature’, which suggested that it was too common to have arisen by chance, and that it must have been amplified through natural selection. That the British and other world populations had maintained the protective signature many generations after their last cannibal feast is a clear indicator of how widespread cannibalism would have been among their ancestors. *Editor’s note: Illustrations accompanying this article are merely artwork, and do not seek to make exact historical replications. Next Is The Sinhala Language Haunted?